No, I don’t mean that kind of sign. I’m thinking more like this kind of sign. Sorry, I couldn’t find a shorter clip. Like Meg Ryan’s character in Sleepless in Seattle, I do not believe in messages from a higher power obliquely telling us what to do. In the highly unlikely scenario in which higher powers exist, I’m quite confident they have better things to do than embed subtext in our daily lives – things like making time flow in the right direction and carving subatomic particles. There is no reason to believe that coincidences (that is, coinciding incidents) have any significance. When my grandmother died, her family disintegrated. For my mom and I, there was no comfort to be had in a funeral. Grandma had a gypsy soul, but her life’s wanderings never took her far from the course of the Colorado River. So my mom and took a trip to England and dedicated it to her memory. I carried a little cloth bag filled with beads and whenever we did something my grandma would have particularly enjoyed, I placed a bead at the site. I like to imagine a bead still sits behind the leg of a cheap seat in the theater where we watched La Boheme; perhaps another remains on top of the window frame that encases the display of the Crown Jewels in London. I’m sure that one is buried under the daffodils that bloom right now in Kew Gardens. But I’m not quite sure where the one in York landed. On a sunny day in March, (March in England is notoriously dreary, but we had sunny weather every day but one of our trip) we walked along the Roman wall in York. I tried to cram a bead between the rocks, but for some reason couldn’t get it into the cranny I wanted. I kept fussing with it until I dropped it; the bead suddenly sprang from my hand as if someone had batted it away. At that moment both my mom and I imagined what my Grandma would have said, “Crippity-crap, just put the damn thing down, will you?” It felt like a sign that she was still with us, that the trip was the right thing to do. A couple of years ago I was working in the garden, working through an internal monologue. I had an idea for a novel involving the Icelandic sagas, but I’d never written any fiction – not since middle school anyway – and wasn’t sure I had what it takes to pull a project like that off. A crow hopped down from a nearby tree and trained its eye on me. At that instant, I pulled a weed and freed a little plastic horse that had been buried in the soil since someone else lived in this house. A few minutes later, I dug up a piece of antler bone. The raven of course was looking for bugs that I might dig up – they are smart birds. 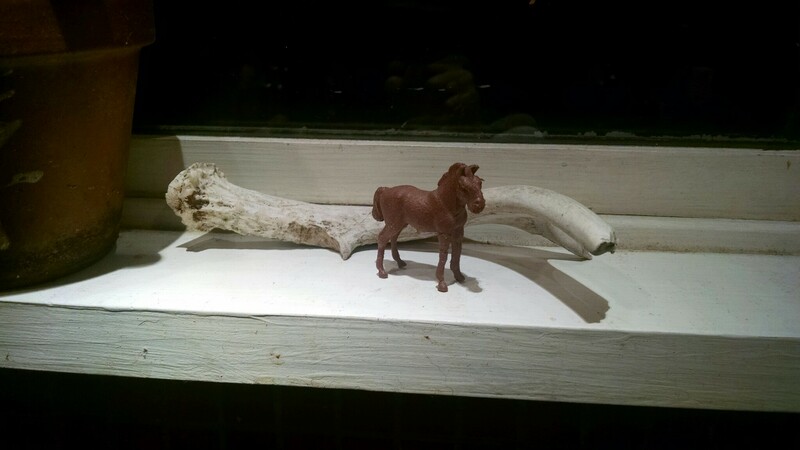 The bone and the horse were toys belonging to some child now grown, buried by accident or in a treasure trove years ago. But I couldn’t help thinking that Crow is Raven’s city cousin, the horse was a necessary companion to Viking lords, and the horn a symbol for pre-Christian gods. Combined, they could only be a sign that this book needed to be written. Last week I was talking with my writing partner about my current project, which involves great spiders. I was trying to determine how much my creatures should draw from real-life arachnids, and how much from my imagination. This resulted in much googling of spider anatomy, and entirely too much exposure to enlarged images of wolf spiders. All afternoon I had the feeling of things crawling on me. Having spent three months in rural South India long ago, I retained the ability to ignore that sensation (otherwise you would never get anything done, you’d spend your whole day swatting at bugs). I ignored it that day until I reached across a table to pick some something up and, glancing down, saw the spider crawling up my arm. Was it a sign? If so, was the sign related to literature or pest control? I still don’t believe that coincidences are messages from above, but I suspect that which coincidences we pay attention to is meaningful. The fact of our noticing one coincidence out of the probably dozens that we experience every day, is a message from within. If we choose to give them meaning, they are messages from our subconscious selves (for the psychologically inclined) or our higher selves (for the yogic-minded) that give us clues about the road we most want to take. This entry was posted in Deep Thoughts and tagged omens, signs, Sleepless in Seattle, Tesla. Bookmark the permalink. Such a beautiful post! I love how you remembered your grandmother throughout England. If I ever go back to London, I know I will be looking for hidden beads. And your last paragraph, about messages from within, is so insightful. I love it! Thank you so much, Susan! I loved your mosaic post on Adventures in YA, and I look forward to reading Southern Fried Wiccan (I really can’t tell you how much I dig that name). Getting to talk with the people who write things you enjoy is right up there with streamlining research as the chief joy of the internet.